During Walt Disney‘s tenure, the creator’s movies are widely known for their wholesome, good old-fashioned conservatism. At first glance, the films harken back to an idealized Rockwellian Americana. However, when examining one of the studio’s most popular features from this era, The Parent Trap, the story is actually more complex than many of its’ Disney contemporaries. The memorable family feature not only creates rich and interesting characters, but also demonstrates much of the subtle societal evolution occurring in Eisenhower’s America. 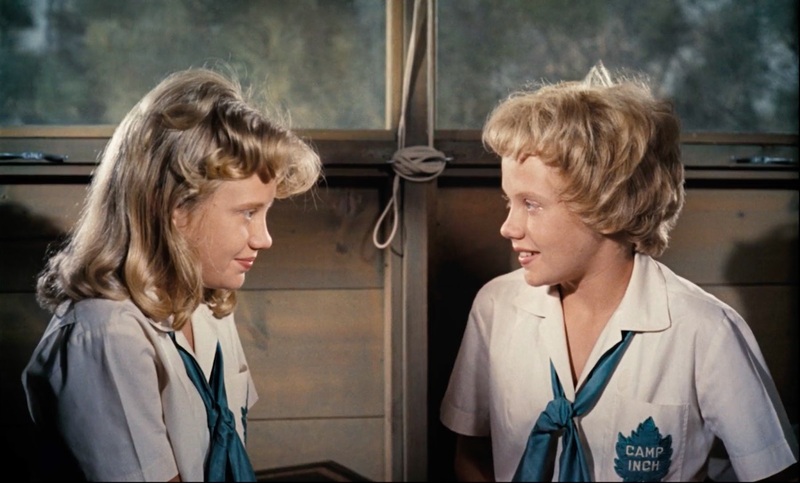 The Parent Trap follows separated at birth identical twins Sharon and Susan McKendrick (Hayley Mills in dual roles). The girls first learn of each others existence while at summer camp. After an initial rough patch, they become fast friends. In an attempt to figure out what each missed while growing up, they switch places. However, things become more complicated than anticipated when their father Mitch (Brian Keith) falls in love with the villainous Vicky (Joanna Barnes). Using their newly found twin powers, the girls stage an intervention in hopes of reuniting their divorced parents. The Parent Trap‘s biggest problem is in the depiction of Mitch’s new girlfriend Vicky. From early in the movie, Vicky exists solely to be the evil, Disney villain. She is Cruella de Vil crossed with Maleficent, minus the interesting back story. She does have fabulous business suits though! In fact, the narrative passes judgement on Vicky before she’s even crossed the screen. While Sharon talks with the family maid Verbena (Una Merkel), the woman immediately proclaims the future Mrs. McKendrick a gold digger. And as the story develops further, Vicky quickly proves the wise housekeeper correct. Vicky shows little depth to her character beyond scheming to get a hold of Mitch’s wealth. In fact, if Vicki had a mustache, she’d be twirling it. Does the character deserve a lot of the misery handed to her by Sharon and Susan? Probably. However, the characterization of Vicky is incredibly unrealistic. Narrative development of the woman underneath is lost, instead Vicky is simply meant to function as an icy foe for Maureen O’Hara’s Maggie. 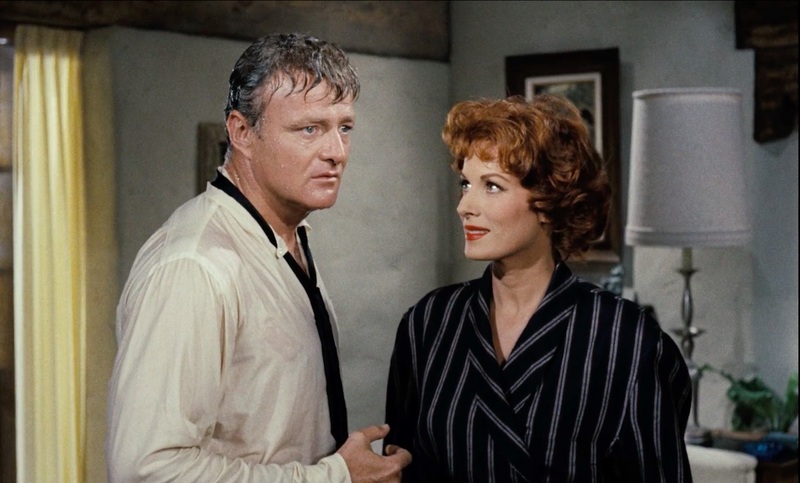 Meanwhile, the casting of Maureen O’Hara in the role of Maggie is a deliberate choice. At the time of The Parent Trap’s 1961 release, O’Hara already established herself as a mainstay in Hollywood. The Irish actress rose to stardom quickly, playing Esmerelda in 1939’s The Hunchback of Notre Dame. She worked regularly into the 1970s, with her last film credit coming in 2000. From the early years of her career, O’Hara brought an independence and sense of spirit to her characters. In fact, she partnered with John Wayne for five films, and showed herself as one of the few leading ladies able to stand toe-to-toe with the larger-than-life actor. O’Hara brought this striking persona to each role she tackled. Not only did she bring this feisty independence to her roles, but she conveyed it with a likable charisma. She stands up for herself in the face of strict rules dictating gendered behaviors, but also pushes these boundaries without being vilified. The development of Mitch and Maggie as a couple plays into The Parent Trap‘s interesting treatment of divorce. Marital separation was a taboo subject, especially in the years following the Production Code’s implementation. The sanctity of marriage is paramount in the document. The code dictates on-screen unions must appear happy, faithful and surprisingly chaste. In fact, divorce is rarely spoken about during the classic era, let alone as the topic of a family film. However, The Parent Trap does not place fault for the divorce on Mitch or Maggie. In fact, when Susan talks with Maggie shortly after they first meet, she asks her mother about the divorce. Maggie explains the break-up in a clear-headed and realistic manner: “Sometimes people just don’t get along”. The film further develops this when Mitch and Maggie first meet after almost 15 years apart. The two are far too similar. They are fiery, volatile and independent people. Maggie is not an unattractive shrew, and Mitch is not a cad. Rather, they were a young couple whose relationship likely cracked under the pressure of trying to raise a family in the years following WWII. Meanwhile, the treatment of the twins shows itself as progressive as the narrative develops. 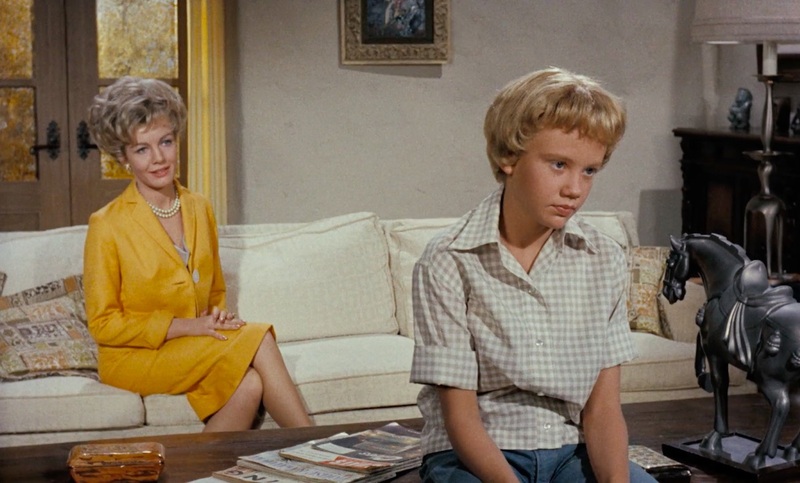 In her dual portrayals, young actress Hayley Mills effortlessly brings two distinct characters to life. The story allows the girls to be different, and stand out as unique and interesting young women. The highly restrictive gender rules permeating in the late 1950s and early 1960s are largely invisible in the film. When they are at camp, Susan and Sharon hike, swim and canoe. Susan is a perfectly happy tomboy, having grown up hiking and riding horses with her father. However, Susan also introduces her long-lost sister to the joy that is Ricky Nelson. The girls are incredibly real and avoid falling into the constraining archetypes which were common during this period. 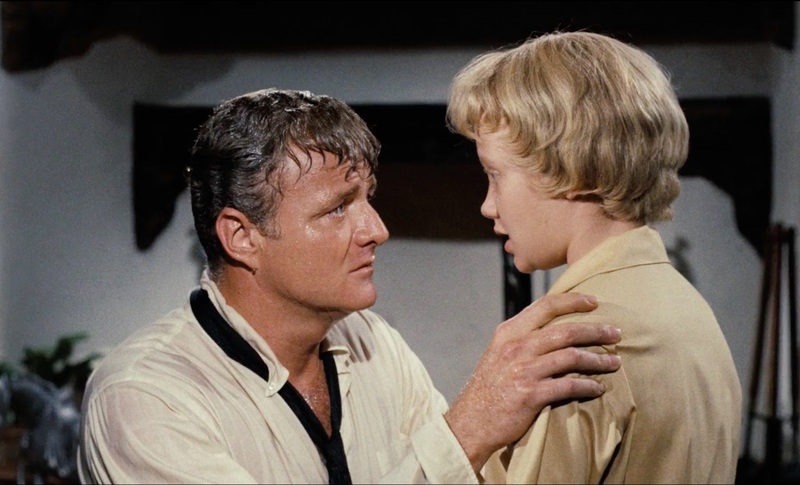 Recognition must be given to actor Brian Keith for an interesting yet understated performance. The actor tends to go a bit unremembered in the face of everything going on around him in this movie. Mitch is the one character surprised by the actions of the plot. He is simply a man trying to marry his fianceé, and he is quite literally the last person in the family to learn what is going on. Further complicating his narrative is Mitch’s seeming inability to truly convey his emotions. Characters often speak of his masculinity (he is a rancher after all), but he seems out-of-place when he needs to connect with his wife or children. However, there are scenes within the film where his quiet emotion shines through in some beautiful moments as when he first learns that Susan is actually Sharon (above). Disney productions were riding high during the early years of the 1960s, and The Parent Trap is one of the best remembered movies to come out of this idyllic period. Watching the film through a contemporary lens, The Parent Trap stands out in its complexity. While it does have its problems, it also showcases a number of unique and realistic characters, largely avoiding the problems of the period, and is much better for it.